​This section deals with the Croft Family in East Witton, from the earliest records of the 16th century to the family still living in the area today. The following maps show the location of East Witton in North Yorkshire, and it's relation to surrounding villages, all of which became inhabited by the Croft family during the 16th -19th centuries. 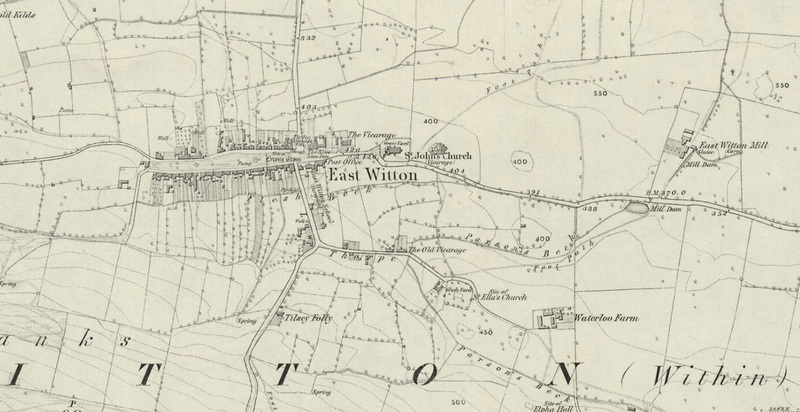 The second map is a more detailed map of East Witton itself, dated 1856. Documentary evidence of the Croft family in East Witton is rather fragmented at first. Parish records of baptisms, marriages and burials have only survived going back to 1664, but evidence of Crofts in and around East Witton exists via several other sources. COTESCUE PARK seems to have been formed in the middle of the 15th century. In 1465–7 payments were made for 72 roods of hedge to be newly made between Coverham Close and Cotescue, from the plantation ('spring') to the fish-pond, repair of the hedge between Cotescue and the moor, making of a ditch and hedge from 'le Halhede,' and repair of the wall. The king's tenants of Middleham granted the vaccary at Slape Gill 'called Coverhead,' within boundaries stated, to Coverham Abbey in 1484 in exchange for 63 acres of arable land and about 8 acres of waste land which the king had inclosed in his park of Cotescue. The office of keeper was committed to Henry Pudsey in 1486 and to Ambrose his son with the forestership of half Coverdale Forest in 1520. Ambrose Pudsey was succeeded in 1522 by Sir John Nevill, whose offices were granted in 1526 to George Lawson for the maintenance of the garrison at Berwick, and assigned in 1536-7 to Ralph Croft. COVERHAM ABBEY received in 1271 a grant of free warren in its demesne lands of Coverham, Caldbergh and (West) Scrafton. The abbey held 1½ carucates of land in Coverham of Stephen de Coverham in 1286–7, and at the close of the 15th century held the same of the Earl of Westmorland, lord of Middleham. In 1557 the reversion, on the expiration of a lease (see the excerpt from Bulmers, below) of the site and precincts including the mill, was granted in fee to Humphrey Orme and Cecily his wife, who in 1563 granted tenements and the mill to Ralph Croft and Anne his wife. Ralph Croft, Francis Bainbridge and 'others' were said in 1575 to be the 'owners of Coverham.' Ralph Croft was succeeded by a son Christopher, who had a son Thomas, owner of the mill in 1610. Another Christopher died seised of the 'site, precincts and mill' in January 1630–1, leaving a son and heir Thomas, but Thomas had livery of only one-third of the site. On higher ground lie Witton Moor and Penhill Park, both enclosed in 1779, when the former contained 1,300, the latter 300 acres. Penhill Park is first mentioned in 1465. A moiety of this park was leased by the Crown to Ralph Croft in 1539. ​So here we have quite a few references to the same Ralph Croft, firstly being granted the office of "Keeper of Cotescue Park" in 1536, and subsequently acquiring land and property in the Coverham area the 1540's to 1570's. He was evidently a man some importance and wealth to be doing this, but perhaps is not that surprising if he was a relative of the Crofts over in Lancashire who were huge landowners at this time. (see Claughton) and of course it was Ralph's grandson, Christopher, who went on to become Lord Mayor of York in 1629, and was knighted by Charles I in 1641. This line subsequently went on to build the mansion near York, Stillington Hall and, among other achievements, began the Croft Port company in Portugal! Further information on this interesting branch of the family can be found on the Croft Port website and also the Stillington Community website. churchwardens of Coverham as non-communicants. From the evidence of the various references to Ralph Croft, (above), the earliest being his appointment as Keeper of Cotescue Park in 1536, and his acquisitions during the following decades, we can surmise that he was probably born sometime during the first two decades of the 16th century. I have seen his birth quoted as 1518, but I can find no document which supports this accuracy, and this birth year would make him only 18 years old, and therefore still a minor, when becoming Keeper of Cotescue Park. I think this is unlikely, and I would place his birth nearer 1510 (making him 26 at his appointment). This would make him about 69/70 years old when he died. There are no records that I can find which mention Crofts in this area earlier than this Ralph, but there are other Crofts in and around East (and West) Witton at the same time, presumably all related as the distances between East Witton, Cotescue and West Witton are only a few miles (easy walking distance). There are no more baptisms of Crofts after 1680, but some burials up to 1706. The name Croft then disappears from the West Witton registers. From the numbers of entries and the names, it looks very much like this is one single family in West Witton. From the list of register entries above, Thomas (having children 1674 -1680) was the son of George (above), Francis (having children 1639 - 1641) was the son of John (above), George (having children 1637 - 1646) was the son of Leonard (above). As John and Leonard were both having children baptised during the same period, it is likely that these two were brothers, perhaps sons of the earlier John who died in 1578. They would have been born around 1550 -1570, but as the records don't extend back this far, it is impossible to prove. Likewise the origin of the elder John (died 1578) cannot be proven, but as there are no other baptisms or burials apart from those which can be attributed to the individuals discussed, we can be fairly certain that this West Witton family started with him. It is my feeling that he was born around 1500, probably in East Witton. There is also a will which has survived of Edmund Croft of West Witton, 1575. He asks for his body to be buried in the Church Yard of Trinity Church at Wensley (not in West Witton, which is odd). This does not appear to have happened, however, as the burial records for Wensley are intact and quite clear, and there is no burial record for Thomas. He was most probably buried at West Witton, but I can't verify this as most of the page covering the burials in 1575 is illegible! In his will, Edmund goes on to name his sister Isabell his executor, and leaves her "all my farmeholde that is in my tenorre & occupation at the houre and day of my death and all my goods moveable & unmoveable". He also names sisters Anne and Gennet to whom he leaves the sums of £10 and £8 respectively. (this would be an approximate equivalent of leaving £3000 and £2400. So by no means a fortune! The inventory of Edmunds goods shows he was a typical smallholder - 2 oxen, 2 horses, 8 sheep, and farming 5 acres of land. The total value of his goods was £17, 17 shillings and 4 pence. (around £5300 in today's terms). It's notable that Edmund makes no mention of either a wife or children, which would imply he was unmarried. His death in 1575 is only three years before the death of the John Croft previously mentioned. I initially thought that perhaps Edmund and John were brothers, but due to Edmund's lack of wife and children, and also the fact that he makes no mention of a brother in the will, I think it more likely that he was the son of John, and died young. Also, there is a marriage of an Isabell Croft in West Witton the following year, and I think this is Edmund's sister. 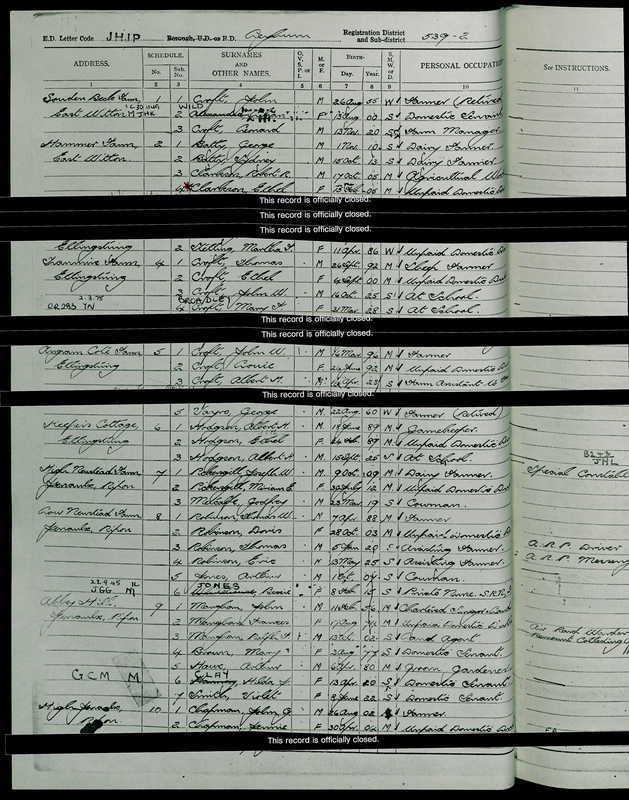 As none of the children mentioned in the baptism records above appear later in the records having children of their own baptised, it would appear that the Croft family did not stay in West Witton, but dispersed to the surrounding area. ​As previously mentioned, the parish registers of East Witton have only survived back as far as 1664, so it is extremely difficult to draw clear family lines before this time. We know for certain that the Crofts were present in East Witton at least 100 years earlier, as there are wills of several individuals dating from the 1560's and 1570's. The earliest will which has survived is of William Crofte, 1563. The will is quite damaged, but is still legible, and in it he refers to his son, also named William. He refers to his wife in the will, but no other sons or daughters. The total value of his goods in the inventory is around £13, which would be the equivalent of around £4000 in today's terms, so he was by no means a wealthy man. In the list of debts owed by William, there are several other Crofts mentioned, including another William Croft, Thomas Croft, and two others whose names cannot be made out clearly. The next will is of Thomas Croft, 1579. (this is possibly the Thomas mentioned in the previous will, and may be William's brother). He asks that his body "be buried within my parish church yard of East Witton as near unto my father my mother & my children as might". This is important, as this clearly indicates that he is not the first generation of Crofts to be buried there. He goes on to divide all his property between his wife Elizabeth, 2 sons Ralph (eldest) and Henry (youngest), his daughter Elizabeth and his sister Agnes. ​From the inventory of his goods, we can see that while is not of the same order of wealth as Ralph Croft of Cotescue, he is comfortably off. He has 8 oxen (for ploughing), 4 cows, 8 bullocks/heifers, 3 mares and 2 foals, 70 sheep, 6 pigs, as well as all the usual farming gear. The sum total of his goods is £133 7 shillings and 4 pence (today's equivalent £40,000). He also leaves 12 pence to each of his two servants (about £25). In the list of debts owed to Thomas there is a mention of "James Croft of the vicarage". I have no idea of this individuals identity, but again, obviously a cousin of some sort. The will of William Croft, 1590, is most likely that of William, son of William, mentioned in the above will of 1563. He refers to his wife, Elizabeth, his 2 sons Ralph (eldest) and Henry (youngest) and his 2 daughters Ellen and Elizabeth, to whom he leaves all his property (but mainly to his wife and eldest son Ralph. His inventory shows William to be considerably less well off than Thomas, mentioned previously. He has only 1 oxen, 3 cows, 3 bullocks/heifers, and 2 horses, along with household goods, work tools and ploughing gear. The sum total of his wealth is £24 (equivalent to £7000 in today's terms). The next will I have is of Henry Croft, 1613. (described as "Yeoman" - yeomen were farmers who owned land (either freehold or leasehold). Their wealth and the size of their landholding varied, and in social status were one step down from the landed gentry, but above a husbandman). As both Thomas (d.1579) and William (d.1590) mentioned above had sons named Henry, this Henry could the son of either. However, since Henry has become a Yeoman farmer, and therefore quite wealthy (relatively speaking) it seems much more likely that he is the eldest son of Thomas Croft, who was himself reasonably well off. Also, in Henry's will he requests that his body "be buryed in the church yard of East Witton aforesaid as neare the place of myne ancestors their buryall as convenientlie maie be". This is extremely similar to the wording on Thomas's will. He refers to his 5 sons, Thomas, Ralph, Christopher, Marmaduke and Henry, and also 2 daughters Frances and Ann. While leaving his eldest son Thomas his farm, land and animals, he bequeaths sums of money to all his children amounting to a total of £113 (equivalent to £22000 in today's terms). His Inventory is the typical mixture of animals and farming equipment, but the list of household items is substantial, drawing a picture of a person who lived comfortably. The total worth of his goods was put at £84, which would be around £17000. Unfortunately, as the parish registers have not survived prior to 1664, it is impossible to draw an accurate family tree for the Croft family in East Witton at this time. However, looking at the names of the children listed in Henry's will of 1613, it is not difficult to see that the Crofts having children in East Witton as we pick up the trail again in 1664 are almost certainly the descendants (children/grandchildren) of Henry (d 1613) and William (d 1590) above. Throughout the period from the beginning of the surviving records (1664), through the 1660's and 1670's, all the Croft baptisms in East Witton are attributed to Thomas, Christopher and John (though there is almost certainly more than one Christopher), so only three or four families. This is consistent with the wills from the early 1600's/1590's which indicated one or two families. Following the records forwards through the late 17th century and 18th century, there is a gradual increase in the number of Crofts, both in East Witton and also spreading to the surrounding area. It is not my intention here to attempt to draw a family tree linking all these Crofts together, suffice to say, they all descend from the same few original individuals previously discussed. (If anyone wishes more detail on this, please feel free to get in touch and I will happily share the info I have). From descriptions in the parish records, we can see a variety of occupations of the various branches of Crofts in the village during the 17th - 18th centuries. As already discussed, the early wills of Thomas, William and Henry (1579 - 1613) show them to be typical, fairly comfortable, smallholders, farming a number of acres of land and keeping some livestock. Once we reach the late 1600's and can use the parish records, we see that their descendants are branching out into other occupations. This is not too surprising, as it was usual for a farm (either owned or leased) to passed on to the eldest son, so 2nd, 3rd sons etc would have to find other means of earning a living. Christopher Croft, during the 1670's -1690's is described as "Shoemaker" or "Cordwainer". Around the same period, John Croft is described as "Skin Finisher" and "Glover". So both these two (perhaps brothers?) are involved in the manufacture of animal skin products. Although I have no evidence of it, there must have been a tannery in the neighbourhood somewhere. Another family member, Ralph Croft, is also a shoemaker some 10 to 20 years later during the early decades of the 18th century. Farming was still a major part of The Crofts lives, with several farms mentioned both in wills and parish records.One farm in particular, Sowden Beck, is first mentioned in connection with the Crofts as far back as 1721, when the tenant of Sowden Beck was Richard Pickersgill, who had married Alice Croft (daughter of John Croft) in 1706. This John Croft was a farmer of the nearby Angram Cote Farm in Ellingstring, about 2 miles from Sowden Beck. The exact identity of John can't be determined, but there is evidence to suggest that he had been at Angram Cote for a long time, perhaps his whole life. John had married (Alice Leeming) in 1686, and had five children (baptisms) during the following decade. All but his daughter Alice died young, and their burials are recorded. While nearly all the baptisms and burials describe John simply as "Shiller" - an agricultural occupation in the production of oats - in the burial record of his daughter Ann in 1701, she is described as "daughter of John Croft of Angram Cote. Whether he had been at Angram Cote throughout his married life, or moved to the farm shortly before 1701 cannot be determined, but another interesting entry in the burial records is of Christopher Croft of Ellingstring, died 1708, aged 85. This would mean that Christopher was born around 1623 and would be just the right age to be John's father! So perhaps this particular family line had been in Ellingstring (and maybe also at Angram Cote) since the mid 1600's. Jervaux Estate records show that in 1708 John Croft and John Pickersgill were both tenants of Angram Cote, so perhaps this is why John's daughter Alice had married Richard Pickersgill, a relation of their joint tenant. The Pickersgill family continued at Angram Cote until the 1740's, but when John Croft died in 1722, he is described as "Husbandman of Sowden Beck". He was still a tenant of Angram Cote at this time, although in his will he is again described as "Yeoman, of Sowden Beck". So John seems to be have a foot in both properties here. In 1728, when his widow Alice died, she is described as "of Angram Cote". After the death of John Croft in 1722, the tenancy of Angram Cote had been taken over by his son in law, Richard Pickersgill, but he also died a year later in 1723. His widow, Alice (daughter of John Croft) remarried in 1726 to Robert Plews. Robert was a thoroughly bad lad however, and well known in the Masham Courts! Only three months after marrying Alice, he was found guilty of stealing 2 bushels of maslin (mixed grain) worth 10d belonging to William Priest, 2 bushels from Henry Tindale, 2 bushels from William Pearson and 2 bushels of wheat from Samuel Atkinson. He apparently stole all these on one night, so it would appear he went on quite a spree! He was sent to York Castle, then transported to His Majesty's Plantations in the American Colonies for 7 years! Presumably he returned in 1734 and resumed his life with Alice, as there is a further mention of Robert Plews appearing as a witness in a court case in 1751. Alice Plews died at Sowden Beck in 1761. (I can't find a record of Robert Plews death however, which is odd). By the late 1700's, the tenants of Sowden Beck were Thomas and Ann Falshaw, and the tenancy stayed with this family until the 1830's. However in 1831 Ellen, daughter of Robert and Ellen Falshaw, married Thomas Croft of East Witton and in the baptism record of their first child a year later, Thomas is described as "of Sowden Beck". Certainly by 1841, the tenancy had passed to Thomas, and was therefore again in the hands of the Croft family. Thomas farmed at Sowden Beck until his death in 1890, and his son John carried on the lease until his own death in 1942. Sowden Beck 1877 - Thomas Croft far right. Sons James and John at the rear. ​Looking back four generations to the great, great grandfather of Thomas Croft of Sowden Beck (b.1802), we have James Croft of East Witton. His birth cannot be determined as it would have been before the beginning of the surviving parish records, but we can estimate it as being in the 1650's, as the baptisms of his children begin in the 1680's. It is impossible to prove, but he would have been around the right age to be a grandchild of Henry Croft who died in 1613 (discussed above). James had 7 children, 4 boys and 3 girls. John, the eldest (b.1684) went on to become an Innkeeper (more of this later), the fate of Richard, the second son, I don't know, Leonard, third son (b.1690) died a pauper at the age of 49 (unmarried, I think), and James, the youngest son (b.1696) became a Whitesmith by trade (but had only one child, a daughter Esther, who died young at the age of 15). Of John's two son's, his eldest, James became the Parish Clerk of East Witton, and his younger son, John, carried on in his father's footsteps and became the landlord of the Fox and Hounds. He married Mary Hornby in 1761 at East Witton, and had three children, John (1762), Dorothy (1764) and Francis (1770). This John also became landlord of the Fox and Hounds, and married Mary Dixon in 1786 at Middleham. 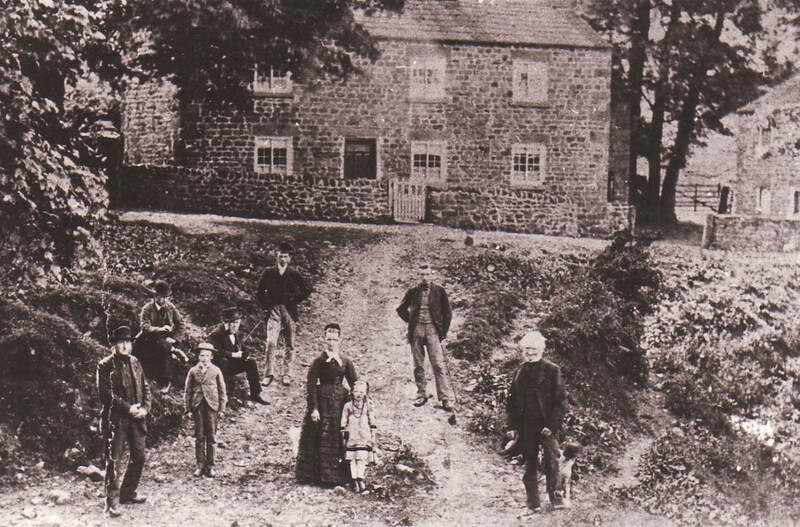 They had a large family (nine children), and in a Jervaux Abbey Estate Survey in 1805, John is listed as being in possession of "a building consisting of a large cottage of stone and slate, called The Fox and Hounds public house, in ordinary repair with a stable and pig sty: also has a butchers shop in middle of street. Fox and Hounds amounts to 4 acres and 16 perches for which he pays £10 rent. It is let to John Croft from 25th March 1805 on a year to year basis." Despite John having several sons, it seems that none of them fancied taking on the Fox and Hounds, as when he decided to retire, it passed to his nephew William Croft, son of his brother Francis (who was a farmer). William Croft remained Innkeeper there until 1881, when a letter from Sowden Beck farm stated "Willie Croft has given up the Fox and Hounds and John Croft butcher has given up his farm, and they are going on to Waterloo Farm. John Rinnie is going to live at the Fox and Hounds, it is going to be no more a public house, but as a Temperance Hotel." This means that four successive generations of Crofts were landlords of the Fox and Hounds, over a period of around 170 years! The Fox and Hounds remains in East Witton to this day, as a Temperance Inn, renamed The Holly Tree. The area around Jervaulx Abbey has been associated with horse breeding for many centuries, long before the dissolution of the Abbey by Henry VIII, and the village of Middleham, a couple of miles north west of East Witton, has itself a long history of racehorse training. Members of the Croft family appear in the parish records of Middleham from the early 1700's, however these 18th century records are all marriages of East Witton men to Middleham women, and it seems that none stayed to raise families there, as there are no Croft baptisms in the records. One notable exception was James Croft, born in 1786 in East Witton, great grandson of John Croft and Dorothy (Innkeeper at the Fox and Hounds, above). He married Mary Lonsdale in 1814 at Coverham (age 28) and had two children, Betsey (1814) and John Janson (1815). In the baptism records James is described as "Training Groom, of Tupgill". (Tupgill Park was an established centre for the training of racehorses at this time). Sadly, both James's son and wife died in December 1815, within a week of the birth of the child. James moved on to work at Middleham after this, and in 1822 he became famous for training the first four horses of twenty three starters in the St Leger Stakes, a feat unequalled before or since! James married again in 1824, at Middleham, to Jane Reaper, but unfortunately died only four years later at the age of 41. In the parish record of his burial it states "James Croft, age 41, A Celebrated Trainer of Racehorses". As discussed in the above sections on Sowden Beck Farm and The Fox and Hounds, the family line which descended from James Croft (born 1650's) via his son John Croft (and Dorothy Thwaites), remained in East Witton running the Fox and Hounds public house until 1881. James Croft (eldest son, born 1722), married Elizabeth Mitton in 1744 and was the Parish Clerk of East Witton. He had six children, 4 daughters and 2 sons. Of the two sons, James and his wife Elizabeth had a family of 2 sons and 3 daughters. Only one son and one daughter survived infancy, the son being James Croft who grew up to be the racehorse trainer, previously discussed. The other son, John, and his wife Ellin had four children, 2 sons and 2 daughters. One son, George, became a gardener, and travelled as far as Berkshire and Devonshire, and had a family of his own. The other son, James, remained unmarried and was a farm labourer until his death in 1872 (aged 80). Dorothy Croft (only daughter of John Croft and Dorothy Thwaites) married Christopher Dixon in 1749. John Croft (youngest son of John Croft and Dorothy Thwaites), as already discussed, carried on in his father's footsteps and became the landlord of the Fox and Hounds. He married Mary Hornby in 1761 at East Witton, and had three children, John (b.1762), Dorothy (b.1764 died age 3)) and Francis (b.1770). Francis, the school master, above, had 2 sons and a daughter, and his eldest son John (b.1847) was the John referred to in the letter from Sowden Beck in 1881 which read "Willie Croft has given up the Fox and Hounds and John Croft butcher has given up his farm, and they are going on to Waterloo Farm." So it was William and his nephew, John who began farming at Waterloo Farm. John (eldest son of John and Mary (Hornby) b.1762) married Mary Dixon in 1786. Of his nine children, 7 sons and 2 daughters, one son became a Master Plumber and Glazier in Middleham, one became a Master Shoemaker, also in Middleham, one became a Groom in the Coverham area, and one also became a Plumber, in Reeth (about 10 miles northwest of East Witton), Their son Thomas (b.1802) married Ellen Falshaw of Sowden Beck Farm in 1831 (see above section) and continued there until his death in 1890. Thomas and Ellen of Sowden Beck had nine children, 6 boys and 3 girls. Two of these sons, Thomas (b.1837) and his brother Robert Francis (known as Frank, b.1839) emigrated to New Zealand in the 1860's, starting another branch of Crofts on the other side of the world! Meanwhile Thomas's youngest son John (b.1855) continued to farm at Sowden Beck. He married Mary Stott in 1890. John and Mary (Stott) had three children, Thomas (b.1893), John William (b.1896) and Francis James(b.1900). In the 1901 census they can be seen all living at Sowden Beck, and again 10 years later in the 1911 census. 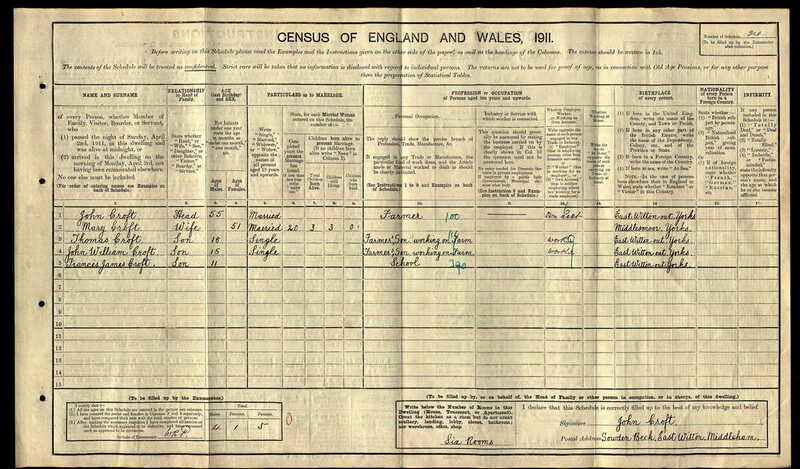 Moving forward to 1939, the census shows that John Croft is still at Sowden Beck now aged 84 years, though now retired and also a widower. His sons have moved on, Thomas is a sheep farmer at Tranmire Farm, Ellingstring (married with four children), and John's son, John William, (also married with a family) is farming at Angram Cote Farm, where Crofts had lived and farmed two hundred years earlier. John himself continued at Sowden beck until his death in 1942. Bill's son Martin (b.1962) follows in his fathers footsteps, still farming at High Newstead, and still showing prize winning pedigree Masham and Teeswater sheep.